Fans of Star Wars, and there are many, will know that today the 4th of May is Star Wars Day 2011, and no doubt many Star Wars fanatics will be celebrating, and if you own an iOS device why not celebrate with a Star Wars iOS app. Thus what we have for your consideration is the Lego Star Was III: The Clone Wars Bounty Hunter Missions app for the iPhone, iPod Touch and Apple iPad, a video enhanced app that teaches the user how to unlock the special bounty hunter missions. With the Lego Star Was III: The Clone Wars Bounty Hunter Missions app for iOS devices the user can view and discover the location of each bounty hunter target that are hidden in various mission areas, and helps to find the quarry. The Lego Star Was III: The Clone Wars Bounty Hunter Missions app features screenshots, professionally edited video, developer approved strategy, how to get gold bricks, achievements and trophies, and voiceover throughout the video explaining how to easily locate the target. 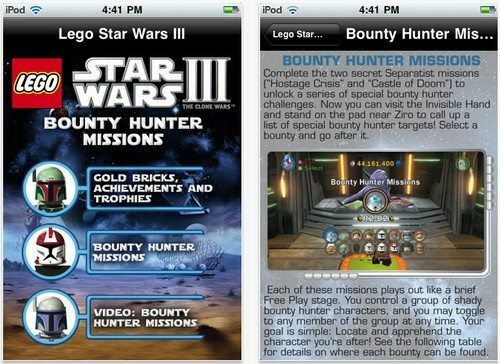 The Lego Star Was III: The Clone Wars Bounty Hunter Missions app for the iPhone, iPod Touch and Apple iPad running iOS 3.1.3 and above is available to download from iTunes at a cost of just $0.99.